We are very proud to introduce Panagement! 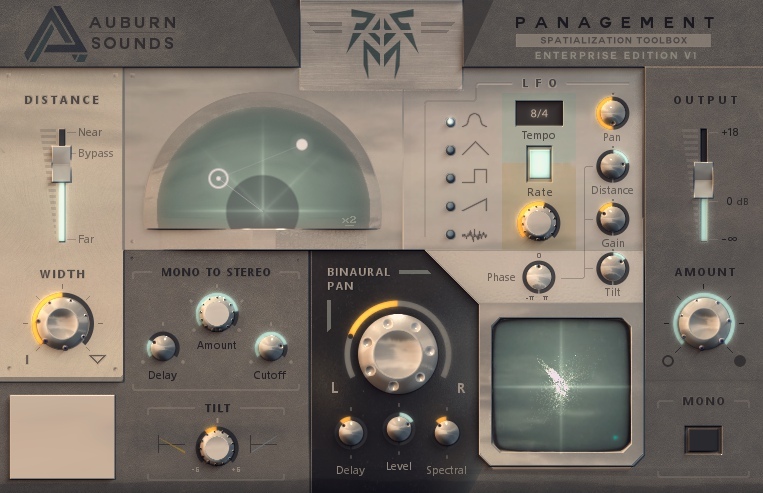 Panagement is a spatialization multi-effect that is at its core a binaural panner combined with a distance panner. Then we went to the next level of obsessiveness and added features to make it an easy, inspiring and pristine-sounding stereo processor. Binaural panning was a topic of Auburn Sounds (formerly GFM) with Psypan 4 years ago. Psypan got a tiny underground following and users sent us emails asking for more. We started paying attention. So we enhanced the basics: inter-aural delay (ITD) and power difference are better tuned. We added a lower-latency delay interpolation. Finally inter-aural spectral difference which enhance realism and externalization further. The result is that Panagement blows Psypan completely out of the water, on its own turf. And that's before you turn on the new stuff. We thought it would be useful to add a Tilt Filter, Mono-to-Stereo, and most of all a Distance fader that would put things further. With all the talk about "Depth" lately, what could possibly create depth more directly and in one click? Our precious beta-testers then asked for a LFO. That turned out to be a very good idea. Panagement in its current form was borned. While we went a bit mad with the features, the hope is that it all adds up nicely and so far the reviews are very positive. We've implemented Audio Unit support in our new framework. In addition to VST 2.4, Panagement works as a 32-bit and 64-bit Audio Unit, in both Cocoa and Carbon hosts. Panagement can be used for free with the Free Edition, or with all features with the Entreprise Edition. Try Panagement now!